We’re delighted to announce details of our third seminar. 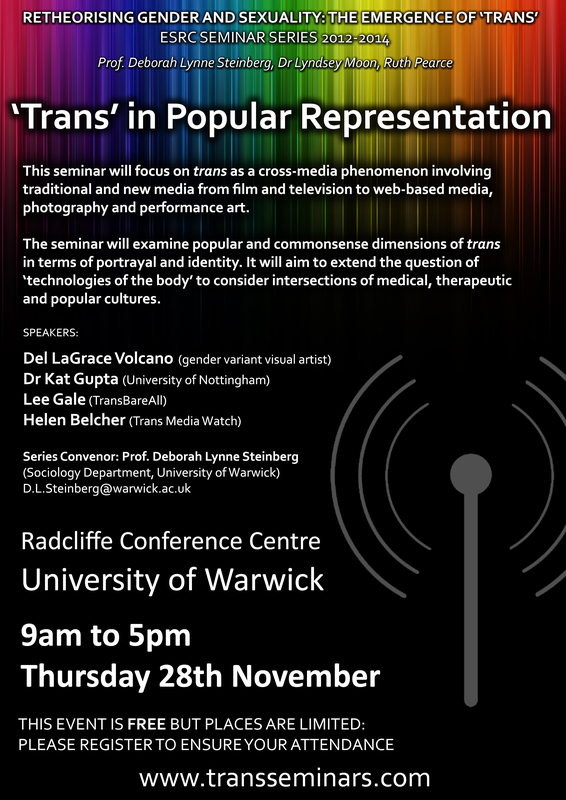 Trans in Popular Representation will take place in the Radcliffe Conference Centre at the University of Warwick on Thursday 28th November 2013. There will be four presentations over the course of the day, from Del LaGrace Volcano, Kat Gupta, Lee Gale (TransBareAll) and Helen Belcher (Trans Media Watch). Further details of the topic areas will follow soon. The event will be highly interactive, with several opportunities for extensive discussion of themes and issues raised by the speakers. A limited number of travel bursaries are available for participants who do not have institutional funds to attend. Let us know if you’d like to apply for one of these bursaries when you register. This entry was posted in announcement and tagged Del LaGrace Volcano, Helen Belcher, Kat Gupta, Lee Gale, media, performance art, research, trans, Trans Media Watch, TransBareAll on October 20, 2013 by Ruth.